Leg 91 – My Biggest Inspiration Is . . . . 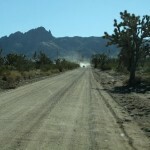 The A2B Route quickly passed through the center of Dolan Springs, Arizona (population 1,867). This very small town has one tiny grocery store, a post office, a hair salon, a couple of small restaurants, and of course, a saloon. Sadly, the kids that live here will have to travel 40 miles to the city of Kingman for a Happy Meal. After running a few more blocks, the distance between mailboxes quickly started to increase as I headed out of town and into the desert once again. I skipped the morning run in exchange for an evening run with my local running club. I love these runs because they present a different kind of challenge. Plus I really enjoy this group of people. They are fun!! On recent runs with this group, I have a friend who has been running some impressive times. She usually comes in a minute or two ahead me. After some thought, I decided to leverage one of my favorite running principles: “I believe my biggest inspiration is the person in front of me.” So, I have been trying to keep pace with her over the past few weeks. But, usually at the course midpoint, she suddenly and dramatically picks up her pace and promptly disappears. Tonight, I was full of determination to stick with her. The run began as normal. During the first 5 minutes, the group runs more or less at the same pace, staying in a pack. Then one by one, runners move into their target pace. The pack transitions into a long string of harriers. After a couple of miles, I took a drink from my water bottle and moved in behind my friend. I set a maximum distance of separation and prepared for her sudden bolt. Just as anticipated, she surged. I sped up trying to match the pace. After a half mile, my legs began to burn a little. But, I kept even with her. Some relief soon came in the form of a hill (the downhill kind). I lengthened my stride a little and let gravity pull me forward. Happily, I finished just a few yards behind her with a fantastic time. So, I guess the race is on! Good times ahead! For the time that my body was running, my mind was purely focused on a yellow long sleeve performance running shirt. I do not remember much else about the run. I do not know if I passed anyone or if anyone passed me. I had a goal to meet the challenge of a large pace increase midway through a long run. (A big goal for me.) And the way to do it was to zero in on one single yellow running shirt. From time to time, I would do quick system checks to see how my body was doing. Other times, I would quickly imagine myself running through some challenge that I knew was coming. (I often do this as a way to prepare for something hard or difficult.) But, for the most part, my body was on autopilot. This kind of focus often astonishes me, as I look back. There is a part of me that thinks I ought to be concerned about the fact that I cannot remember nearly anything else that happened during that hour. But then I think, the “autopilot” was covering the essential details. The truth is that I appreciate and, where possible, enjoy this level of focus. There are moments when this extreme power of concentration comes in response to a crisis. In cases like that, it is pure reaction and adrenaline. I remember once having to quickly get my daughter to the emergency room. It all happened without thinking. I have also found that in other less critical circumstances, this nuclear reaction of thought can happen by choice. All that is needed is preparation and desire. Desire is the more key of the two ingredients. Desire drives action and persistence. For me this, this is important. Intense desire is the means to my ambitions. So I feed it! The focus I experienced on this run gets me excited. It gives me a glimpse of some of the things that I am capable of. Do you have any thoughts or comments that you would like to share?